It was easier than I thought it would be to switch the thermostats to cooling and hook up the circulation pump as the primary pump on the system. I just had to switch the white wire from heat to cool. 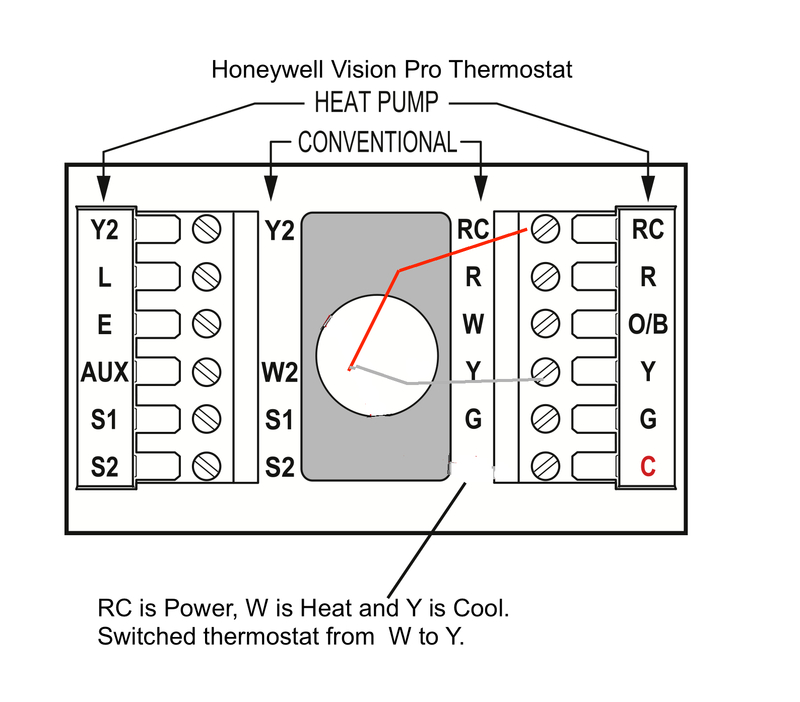 Eventually I will re-wire the thermostats with 4 strand wire. The pump had to be rewired to turn on when the thermostats called for cooling to circulate the water that is cooling by moving through the heat exchanger and becoming lower in temperature from the chilled water in the storage tank. 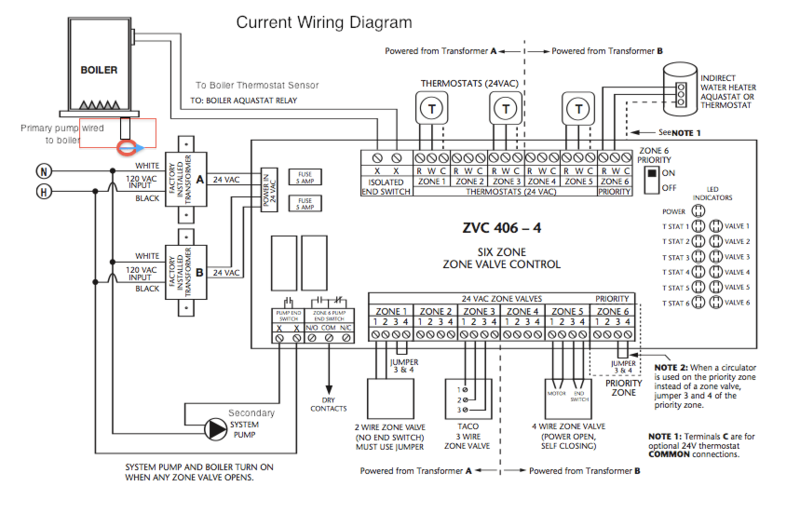 This is the original wiring diagram that was redone for this system. The actual boiler setup using the Fireplace Boiler as a secondary heat source is not yet wired or figured out. The storage tank circulation pump is just running all the time–as an energy efficient EMC pump that is not a huge efficiency drain. With the heat cycle that pump would only turn on when the water is hot enough and only on a call for heat. I’m still trying to follow the logic to allow the primary pump and boiler to come on after the heat from the storage tank is used up. Radiant cooling has been running for about an hour now. The chiller has still not come back on as the storage tank water has only given up about 5 degrees. The temps in the house will take more time to come down since radiant cooling is cooling of the surrounding surfaces not the air itself. At least the temperature in the house has not gone up as the outside temperature approaches a high of 84 today. Currently it is 81 outside and 75 inside with all the windows closed. I’m hoping to keep the house cool to get more work done this summer! Update: The temperatures in the house did begin to go up and wound up at about 78 degrees. After a full day of running off and on for a few minutes each time, with the sensor telling me that the chiller was working, I began to suspect that it was not. Overnight I realized I had a new sensor that came with the controller–so I plugged that one in first think in the morning and taped it to the delivery pipe where the water should be the coldest. The temperature measured 75 and continued to measure about 75 for the next two hours as the chiller ran. Oh oh. I felt behind the chiller and NO warm air was coming out. DARN there goes my good deal. I’m glad I installed it as soon as I got it so that I could test the system. I have filed a return request and will also return the controller. 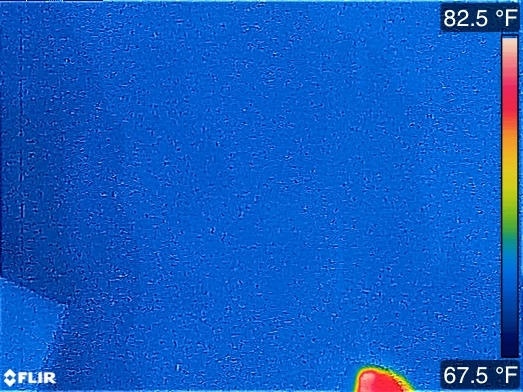 I took a couple of thermal images to see if the floor was getting cooler and I got a solid photo! This basically shows that the floor had NO cooler water running through the pipes as it is all one solid color, with only my toes for contrast. This entry was posted in Radiant Cooling. Bookmark the permalink.